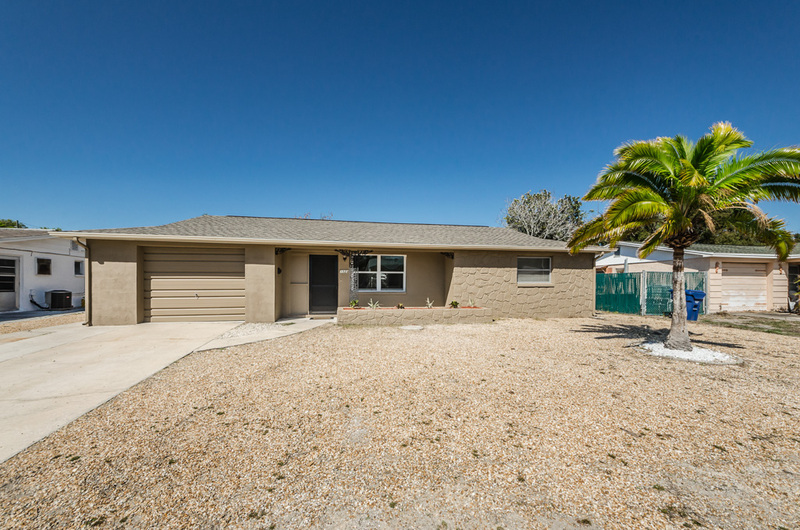 The interior updates to this Holiday home, just north of quaint Anclote Blvd, provide the perfect palette to create a distinctive living space. Outside, a new roof and exterior paint are accented by wrought iron trim. Inside, all interior walls are freshly painted and complemented by new six-panel doors, illuminated by new ceiling fans and light fixtures throughout. Oversized doorways enhance the transition from spacious room to spacious room. New blinds grace the windows. Lush, new carpeting flows through the living room, family room, and both bedrooms. Situated in the rear section of the home, the bright family room offers access to the unique covered porch space that’s ripe for design ideas. The eat-in kitchen features a cozy nook to accommodate a table/two chairs for casual dining, in addition to a full-sized dining room off the kitchen. The kitchen itself shows like a model. New, rich cabinetry offsets the contrast of the new countertops, while the fresh, beige tiled backsplash with decorative glass inset lends to the sleekly immaculate look that includes a new range and refrigerator. Both bedrooms are not only light and airy, they each feature generous closets made beautiful with functional cedar-planking. The full bath is well appointed, boasting a new vanity, sparkling sink, and new commode beneath a large plate glass mirror. The garage presents a multitude of possibilities. With its washer/dryer hook-ups and half bath with new commode, this viable space can serve as a workshop or office space. https://trinityeastlakerealestate.com/wp-content/uploads/2018/03/LC-WebLogo-340x156-300x138.png 0 0 loricrawford https://trinityeastlakerealestate.com/wp-content/uploads/2018/03/LC-WebLogo-340x156-300x138.png loricrawford2017-03-23 18:36:552017-03-23 18:36:55MOVE IN READY!